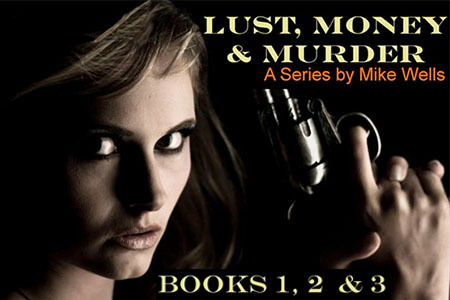 For those who are fans of the late Sidney Sheldon (in particular his latter works) then may I suggest Lust, Money & Murder – the first in a three part series written by Mike Wells? The novella possesses most of the components that made Sheldon’s books so captivating. A fast plot. International intrigue. And a beautiful heroine with a troubled past who uses her inner resolve to climb her way to the top. The striking heroine, in this case, is Elaine Brogan. Young, innocent and possessing a touch of naivety, her initial desire to become a model turns deadly after she becomes involved with a phony modeling agency. Elaine soon finds herself vying to become a secret service agent, all in an attempt to exact revenge on the man who caused her, and her father, so much pain in her youth. Elaine’s journey takes her from the ‘burbs of Pennsylvania to life in exotic Bulgaria…where she meets the handsome, adventurous Nick LaGrange – a man who could either become the love of her life or the downfall of her career. Wells does his research (although there are several instances of ‘information overload’ where Wells tells the reader facts rather than shows them). Nevertheless, readers will get a detailed account of what it takes to join the secret service, how to detect counterfeit bills as well as what the reality of life is like for young women living in Bulgaria. The title feels slightly dated and some readers may feel frustrated with the abrupt ending, but stick with it – book one concludes with a cliff-hanger that will make you want to purchase the rest of the series. Book review by N M Lorde. One Response to "BOOK REVIEW: Lust, Money & Murder – Book 1 by Mike Wells"
After reading the entire series, I can say it’s completely worth downloading. Full of twists you wouldn’t expect, I found myself hooked on a couple of the characters. Even if you have little time to read, as I these days, its a story you can’t miss out on.